Bukit Lawang is the name of the natural area that protects the population of orangutans. This animal rehabilitation center is located in the middle part of Indonesia, in North Sumatra. This little village is located about 86 km northwest of Medan, and lies along the banks of the river Bahorok. On the east it borders the national park Gunung Lucero, which is a favorite tourist destination for residents of Indonesia. This rehabilitation center for orangutans was founded in 1973 by two Swiss zoologists - Monica Borner and Regina Frey. 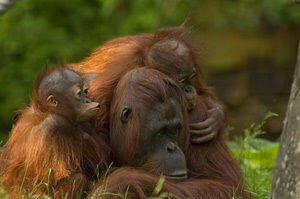 The main purpose of the Bukit Lawang reserve is to protect the population of orangutans in their natural habitat. To a large extent the project is successful, given the threat to the decline of their number after the massive logging of rainforests and illegal activities. There are about 5 000 representatives of this species living in the park Bukit Lawang, who charm visitors with attractive behavior. Fully managed by the Indonesian government, the park carefully takes care of the increasing population, providing two meals a day to the orangutans. The main goal is that over time the animals themselves will learn how to get food from the jungle. Here, tourists have the opportunity to observe orangutans in their natural environment. The translation of the word orangutan from Indonesian means forest man. Furthermore, observing of these colorful animals in both parks in the area present many opportunities for hiking, descents down the river with inflatable boats, as well as swimming swimming. Tourists can also go on interesting tours to the cave that is located next to the rehabilitation center. In it, one is able to see many bats.